The Republican establishment has become infected with a new viral epidemic of “Ted Cruz derangement syndrome” apparently brought on by being forced to actually work at the job of being a United States Senator. 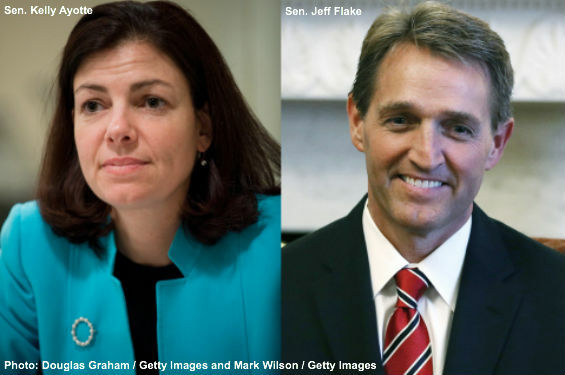 “Patient Zero” in this epidemic may be New Hampshire Republican Senator Kelly Ayotte who complained bitterly before last weekend’s rare Saturday session to debate the Cruz - Lee constitutional point of order on the “CRomnibus” that it interfered with her plans to go home and watch a performance of the holiday classic the Nutcracker. Ayotte, by the way, has an F score of 44% on Conservative Review’s Liberty Score, compared to Cruz’s score of 95% and Mike Lee’s score of 100%.. In truth, Ayotte and the 19 other Republicans who joined the Democrats to vote down the Lee – Cruz constitutional point of order don’t really want to face the implications of their actions, so they have thrown out all kinds of other garbage in an attempt to distract voters from the fact that by voting down the constitutional point of order they have in effect endorsed the constitutionality of Obama’s planned executive amnesty. The most common smear these purveyors of “Ted Cruz derangement syndrome” have been peddling is that by making them work on Saturday Cruz and Lee somehow advanced the Senate confirmation of many of Obama’s pending nominees for federal judgeships and executive positions. And that smear has been spread by establishment Republicans in the media, such as the sometimes conservative Daily Caller’s Matt K. Lewis and our friends at The Washington Examiner, all of whom should know better. Anyone who claims to be a national political commentator should be familiar enough with the Senate rules to know that there’s only one guy in Washington who sets the Senate agenda and floor time and that’s the Senate Majority Leader, and for another couple of weeks that’s Democrat Harry Reid. Among the remaining “must pass” business on Reid’s agenda were bills funding the government, reauthorizing defense spending, extending tax deductions and clearing nominations. But everyone in Washington was on notice, because up until the “CRomnibus” passed the House Reid had spent much if not most of the Senate floor time voting on Obama’s nominees – and according to our review of the Congressional Record, to little or no opposition from establishment Republicans. The fact of the matter is that Senators Ayotte and Flake, and the other Senate Republican whiners about working on Saturday, are the same Republicans who have some of the worst records for opposing Obama’s nominees. You’d be hard pressed to find an instance where any of them took to the Senate floor, particularly since December 1, to oppose an Obama nominee for any office, let alone a lifetime appointment to the federal bench. But the hypocrisy of their position hasn’t stopped them from spreading the virus of “Cruz derangement syndrome” to carriers like Matt K. Lewis and the editors of The Washington Examiner, all of whom should have long ago been inoculated against such nonsense. You can read our article “The Exquisite Hypocrisy Of 20 Republican Senators” through the link. The smear against Cruz and Lee that their constitutional point of order against the “CRomnibus,” that forced Senators to actually work on Saturday, somehow advanced the confirmation of Obama nominees who would have otherwise died on the vine in the waning days of the 113th Congress has no basis in reality. It is instead a well thought out plan by establishment supporters of amnesty to spread “Cruz derangement syndrome” into the general population of conservative voters, who so far have proven immune to its debilitating effects. We urge you to forward this article to your friends and use your social media channels to get the word out that this is nothing more than an establishment attempt to smear Cruz and Lee and distract voters from the real fights – the existential battle over amnesty for millions of illegal aliens and the future relevance of the Republican Party to conservatives.. Submitted by captneal on Tue, 12/16/2014 - 18:21. I remember Kelly Ayotte's first floor speech and she had all the right words. I guess that if she really meant those words back then it did not long for her to take up with McCain, Graham and Flake. They along with many other Republican Senators are just Progressives in Republican clothing. I do not call them RINO anymore they are not even that. Submitted by sdofaz on Tue, 12/16/2014 - 14:27. The very worst person to say anything about doing his job is Flakey Flake. This man will not make it to the second term in AZ. He is an absolute flake and not worth the trouble to argue with him. We made a big mistake with him and now those who voted him in are realizing it. I did not vote for him but now everyone knows the truth about his BAU and big business handlers. Obviously we can't trust him or McCain. Both are losers. Submitted by stepman on Tue, 12/16/2014 - 14:00.